If the player equips the sash while mounted, they are dismounted by the transformation. If the player equips the sash while polymorphed, nothing happens. If the player returns to normal form with the sash equipped, the sash must be re-equipped before the player is transformed, or wait until midnight. 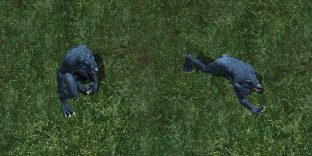 Werewolf graphic in Enhanced Client.